At a commemorative event, journalists discussed how to carry forward Bukhari’s advocacy for peace in Kashmir. 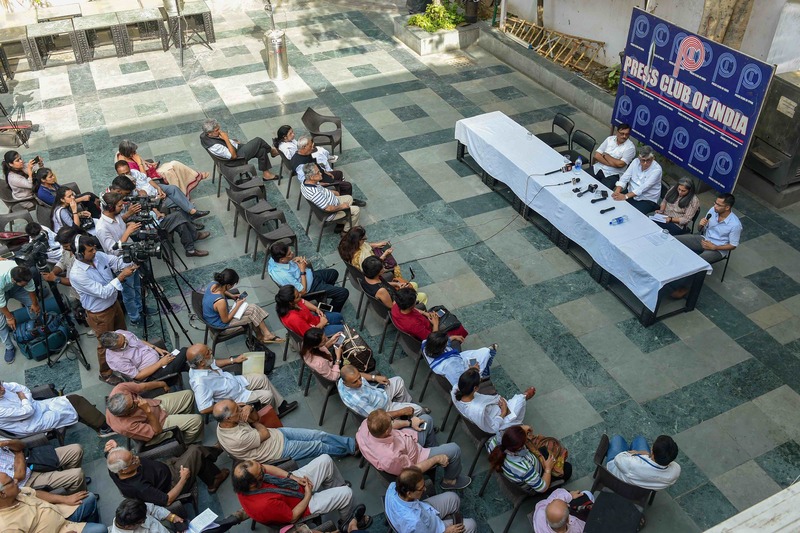 New Delhi: Hundreds of journalists gathered in New Delhi on Monday, June 18 to show solidarity following the recent assassination of Shujaat Bukhari, editor-in-chief of Rising Kashmir. Bukhari was shot dead on Thursday by unidentified assassins. The police have released images of three men on a bike, whose faces are covered. At the time of the attack, the journalist was with Jammu and Kashmir police constables who were assigned to him as personal security officers. Two of the officers were also killed in the incident. Eleven journalists’ organisations from South Asia released a joint statement at the commemoration. “Everyone in this country has this sovereign right to freedom of speech and expression. The increasing intolerance to such freedoms has the potential of undermining the character and nature of democracy itself,” said the statement. The statement has been issued by the Press Club of India, Indian Women’s Press Corps, Press Association, Editors’ Guild, SAFMA and South Asian Women in Media, IJU, FCC, NUJ, Working News Camerapersons Association and All India Urdu Editors Conference. The solidarity event in Delhi was attended by hundreds of journalists. Journalists Vinod Sharma, Jyoti Malhotra, Nidhi Razdan, Urmilesh, Sheela Bhatt, Amit Baruah, Nilofar Suhrawardy, Anil Narendar, Anand Sahay and Siddharth Varadarajan spoke about their association with Bukhari, the situation in Jammu and Kashmir as well as the uneasy atmosphere for the press in India. Abdullah, a reporter from Rising Kashmir, as well as Bashir Asad, a long-time associate of Bukhari, also spoke at the event. Speakers took the floor to recall Bukhari’s work over the decades in order to advocate for the prospect of peace between Delhi, Srinagar and Islamabad. “Shujaat, we miss you,” said Sheela Bhatt, member of the Editors Guild of India. “If you met Shujaat, you would understand the whole of Kashmir,” said one speaker. Others called him a peace activist. “He never stopped a good story,” said Abdullah, Bukhari’s colleague from Rising Kashmir. “If people in the mainland care about us, they should support us in our cause for peace. People dropped out of peace talks because they have to appear on a TV news channel. I don’t care about politics. I care about Kashmiri society,” said Bashir Asad, Bukhari’s friend from Kashmir. Others spoke about the work he did apart from journalism to raise the prospect of peace in the region. “Shujaat had friends everywhere, in Delhi, Srinagar, Islamabad. The tragedy of Shujaat and the situation in Kashmir are inextricably linked,” said Amit Baruah, resident editor at The Hindu in Delhi. “Personally, what I admired about Shujaat is his work in Track 2. Not just between Delhi and Islamabad but also between Delhi and Srinagar. And his work to bring together Pandits and Muslims. I want to thank him for that,” said Nidhi Razdan, executive editor at NDTV. Many spoke about ways to carry forward Bukhari’s work. One speaker explained Bukhari’s attempts for years to form a South Asian press club. He said that he would be organising a conference on this in Nepal later this year to discuss how to take Bukhari’s plan forward. Journalists encouraged each other to continue to report the truth fearlessly. “Shujaat defended the shrinking space of reason. It is my genuine concern that there may not be people to fill the gap he left. Today journalists are under pressure from the government, who tells us what is or is not journalism. Here we can brush it aside, even laugh, but not in Kashmir,” said Varadarajan, founding editor of The Wire. “The ultimate tribute to all those journalists who have died and suffered is to report diligently and speak truth to power. We may not have the wherewithal to find out why they were killed. But we need to do our jobs as a tribute to them,” said Baruah.